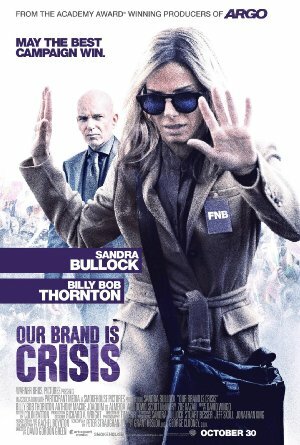 Academy Award winners Sandra Bullock and Billy Bob Thornton in ‘Our Brand is Crisis’. In 2002, Gonzalo Sánchez de Lozada was elected to his second term as the President of Bolivia. He hired American political consultants James Carville, Stan Greenberg and Bob Shrum as his campaign advisors and they brought him a victory. Three years later, an excellent documentary on the election and the role of the American consultants in it, written, produced and directed by Rachel Boynton came out. The 2015 movie of the same title is a fictionalization of the story, and is a project George Clooney began working to bring to the big screen nearly nine years ago. Joaquim de Almeida, known for his roles in action films like Clear and Present Danger, Desperado and Behind Enemy Lines is “Pedro Castillo.” The former president is a wealthy man who wants to regain the presidency but is trailing very badly in the polls to “Rivera” (Arcella). So he hires “Ben” (Mackie) and “Nell” (Dowd) who reach out to the fiery trainwreck “Jane Bodine” (Bullock). ‘Calamity’ Jane gave up her work as a campaign strategist after losing several times to her nemesis, “Pat Candy” (Thornton). There is very little difference in the methods of Ms Bodine and Mr. Candy. Either will stoop just as low as necessary to bring victory to their candidate. Not because they are true believers, but because they have that intense, Vince Lombardi inspired belief that second place is merely first loser. Just when you think one of them has stooped to a level beneath the baby bump of a pregnant ant, the other manages to out-do them. It’s an interesting, but eventually painful battle to watch. The question is, have the experiences of Jane Bodine that drove her to become a recluse and what she sees and hears in Bolivia been enough to cause her to grow a conscience? Sandra Bullock and Billy Bob Thornton are both gifted actors, but they are only as good as the material they are given and how they are directed. There was some seriously untapped potential in this film that did not make it onto the screen. But I don’t want to make it seem that they weren’t good in this movie, as they were. Just not as good as I know they are capable of being. Conversely, I found the performance of Joaquim de Almeida to be exceptional. As the billionaire former chief executive of a nation, he puts just the right touches on how he communicates with others, at every level of society. He is completely believable in the role. Anthony Mackie and Ann Dowd are solid. Zoe Kazan was the perfect choice for her small but important part. What Our Brand is Crisis does extremely well is illustrate how much elections are more about convincing the electorate that their particular candidate isn’t so much the better choice, but the best choice among a bevy of bad choices. Once again proving that the lesser of two (or more) evils is the evil of two (or more) lessers. Plot: A battle-hardened American political consultant is sent to help re-elect a controversial president in Bolivia, where she must compete with a long-term rival working for another candidate.